DIY Window Soundproofing - 7 Best Ways How to Soundproof a Window! Blog DIY Window Soundproofing - 7 Best Ways How to Soundproof a Window! 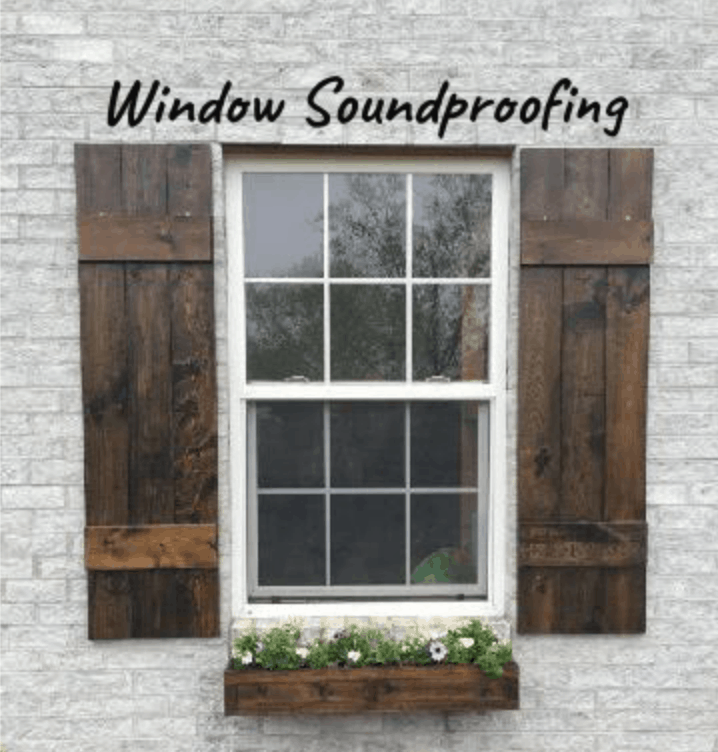 DIY Window Soundproofing – 7 Best Ways How to Soundproof a Window! One of my colleagues run a recording studio in his home for podcasting. He needs the studio to be as soundproof as possible. He contacted me to see if I could help him soundproof a window. There are many different ways to go about soundproofing windows. In this article, I will explain different ways how to soundproof a window in your home as a cost-effective DIY project. Typically when soundproofing anything, you would need to place thick and dense materials that can block sound from coming through a window. On top of that, you should also place sound absorption panels on the walls. Even furniture and rugs help to make a room sound better by reducing the echo within. Many homeowners make the mistake of thinking that acoustic foam panels (like you’d see in a recording studio for acoustic treatment) is an excellent soundproofing product. Foam panels are inexpensive and seem professional. However, that’s for absorbing echo and NOT for soundproofing a room, door or window. Click here for our acoustic treatment vs. soundproofing article. Do You Need the Window at All? Option 1 – How to Soundproof a Window With a Window Block? Option 6 – Maybe Consider Replacing the Window and Call it a Day! The first step should be to determine if you even need to have a window in the room you’re soundproofing. If you don’t need a window at all then you can simply remove it and block it completely. Removing and blocking a window would be the best soundproofing method because you replace the window with thick, dense material where noise has more difficulty going through. If you can NOT block the window, there are a few other ways to go about it. I always recommend not permanently blocking a window for soundproofing. You might want to sell the house someday and the majority of people would not want a windowless room. Blocking a window could be the reason your home sits on the market when trying to sell. Here are our 7 Best options for how to soundproof a window. I have never built a temporary soundproof window blocker, but I did find this great video on Youtube of a guy that made one for his recording studio. While watching the video, I was impressed at how easy and functional this type of soundproofing treatment could be. I will explain the process he used, or you can watch the video below. For convenience, I included some Amazon link for the products you will need to get this DIY window soundproofing block done. First, you need to measure the window. Make sure to have the exact measurements because you do not want to go through building one of these and not have it fit. If there are cracks on the sides, it renders the soundproof window block useless. Measure the interior of the window frame you want your soundproof box to fit into. Cut a 1″x4″ piece of plywood accurately from the measurements you gathered. It wouldn’t be a bad idea to attach some diagonals on at least two corners to keep the box frame securely square. Seal the inside of the box where each section of the frame comes together. I always use Green glue noise proofing sealant from Amazon. Now it is time to place the Roxul Rockboard Acoustic Mineral Wool Insulation (Amazon link). Make sure the acoustic insulation fits tightly inside the box. Place a 1/2″ sheet of cement board the size of the interior of the box frame over the insulation. You can also use a super dense acoustic foam cut to size like this one (Amazon link). Hold the sheet down with your body weight and securely screw it in place and then throw some acoustic sealant around the edge of the sheet. Finally, place the back of the box in place and seal it shut with some green glue sealant and securely screw it down. Screw down some heavy duty chest handles to insert and extract the soundproof box from your window easily. This method is a bit unusual for soundproofing a window, but it does work very well actually. 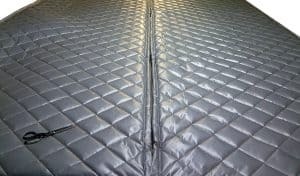 Singer Safety Double Faced Quilted Fiberglass Panel (Click here for current Amazon price); can be used for window soundproofing with a few modifications that will make this item work even better. This particular fiberglass panel is 4 feet wide, 8 feet tall and 2 inches thick weighing a whopping 12.4 pounds! This panel reminds me of moving blankets but thicker and heavier. Which is what you need for soundproofing, the denser, the better. These types of fiberglass window panels cost a bit more than just regular soundproofing blankets but the quality is there, and the best thing is you can soundproof two windows by cutting the panel in half. I would suggest not hanging the window panel with the hooks that come inside the box. Instead, you should use double-sided velcro tape (Amazon Link) and stick it on the window frame. Tape the full length of each four sides and do the same on the panel. By doing this, you avoid having cracks on the sides letting the noise into the room. If you don’t want to block your window permanently and you’re in the market for blinds, I have a suggestion. Honeycomb sound absorption blinds will help absorb some of the outside noise and help in soundproofing your window. 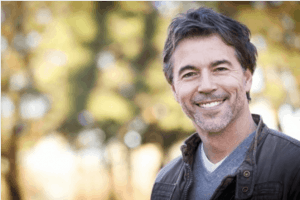 Of course, blinds will not give you the same effectiveness as sound deadening curtains, but if you’re buying blinds anyway, these blinds will help. I actually have these blinds (Calyx Interiors Cordless Honeycomb Blinds Amazon Link) for our master bedroom. They were in our soundproof nursery when the kids were babies, and we find they work OK knowing full well of their limitations. Sound blocking curtains do an excellent job at cutting some of the outside noise from coming in through the window area. Sound blocking curtains do an excellent job at cutting some of the outside noise from coming in through the window area. You certainly shouldn’t buy sound deadening curtains thinking they are 100% soundproof because they are not. One thing it does, however, is spruce up a room with lovely thick, high-quality curtains and help block sound. Another advantage in installing sound deadening curtains is that they do a great job at reducing the echo effect. See, I just saved you some money on acoustic panels! Acoustic panels help minimize echo by absorbing the sound inside the room. Sound blocking curtains have the same effect. And that is how you kill two birds with one stone! If you install noise blocking blinds in conjunction with noise blocking curtains, you’re well on your way to making your window more soundproof. Remember that for sound absorbing curtains to be effective; you need to get a higher number of panels than usual so that they thickly cover the window area. The curtains should also extend at least 4 inches beyond all edges of the window. 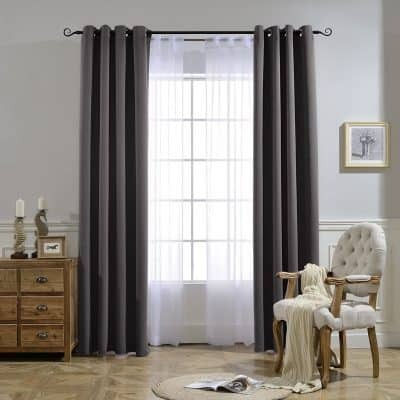 Usually, these types of curtains are longer than average and go up all the way from floor to ceiling. Any gaps in the curtain will lessen its soundproofing effect. These are the sound blocking curtains I recommend from Amazon. Also, click here to check out my article on sound blocking curtains. The Indow window soundproofing inserts are very impressive. I’ve never tried these and I also don’t know anyone that has, but by looking at the video below, it seems interesting. Bellow is the description taken from the Indow website. The video below is a “before and after” demonstration for the Indow window insert. I found an actual review from a customer since i find them more reliable than the companies demonstrations. To my surprise, this review and the companies review had the same results. You can buy a SAMPLE KIT from Amazon. The money you spent on a sample kit will go towards purchasing the full product if you decide on pursuing this route. I’d rather spend 25 dollars on a sample kit vs. buying the full version and not liking it. If you have a few hundred dollars to spare, you can hire a professional to replace your window with a soundproof window. This option can be expensive because of parts and labor. Most of the other options are DIY unless you’re handy with these types of projects then this might be the best choice for you! This expensive fix can run upwards of 800 dollars from my experience. If you hire a professional, make sure they have soundproofing experience. If you hire from a big contracting company, you could most likely get someone that knows what they are doing regarding soundproofing. An expert in soundproofing will not only install and seal the soundproof window, but they will seal around the window with an actual soundproof sealant. Soundproofing sealants around a window will make a world of difference since these types of acoustic sealants will never crack; And will always stay flexible for the life of the window! After window sealants begin to crack, the outside noise will come through rendering the expensive project a FAIL! What can I say, If you don’t really care about light entering the room or a summer breeze flowing inside, you may just as well block the window permanently. This option would probably be the most expensive one. Blocking a window means making the inside and outside of the home look like there never was a window there, to begin with. Of course, you could do a cheap job if the outside and inside the aesthetics of your house mean little to you. But if it does, then you should hire a professional contractor. The contractors will block the window with soundproof insulation. Drywall on the inside and siding that matches the rest of the house on the exterior. That is how it’s done in the video below. There are also many videos on Youtube about how to block a window using bricks and cement. That might appeal to you if the window is under a deck and not visible. There you have it, seven options on how to soundproof a window. Soundproofing a window can cost you $50 like it can cost you $1000. Please let us know in the comment section below what option you chose; and how it’s working for you. Let us also know if you have an option 8, 9 or even 10! We would love to hear any new ideas that could potentially get the job done easier and cheaper. Do Soundproof Curtains Actually Work at Blocking Outside Noise?